I know, it sounds a bit novelty doesn’t it? Like I was trying to come up with a festive pizza or something. I wasn’t (although it’s got me thinking) but was instead wondering whether it would be as good as our favourite pizza of the year: the cavolo nero pizza. It wasn’t as good but we both enjoyed it anyway. The Brussels sprouts (which had been previously sauteed in olive oil and butter) weren’t as deep and earthy as the cavolo nero but they did have a bitter edge that added an interesting flavour to the pizza. The salami balanced that bitterness nicely, as did the sweet tomato sauce. Subscribe to comments with RSS	or TrackBack to 'Brussels Sprout Pizza'. Brussels sprouts on pizza, now that is something I am willing to try, especially if it will get me eating more of these little cabbages 🙂 Thank you for sharing this and planting the idea in my head. I would have to go with the cavolo nero EVERY time! When I asked Fire & Stone’s PR person why they didn’t put brussel sprouts on their Christmas pizza they told me it would be a step too far (and stuffing on a pizza isn’t?!) Oh how I laughed. Thanks LexEat, Merry Christmas to you too! Lizzie, glad you asked! Just looked up that pizza… they have roast potatoes on it too… not sure I could bring myself to put potatoes on a pizza. Ha, I was just about to say that I think it’s quite common (popular, I’m not calling you common, Helen!) but ROAST potaotes? I can’t believe Fire and Stone is still around. I remember a dreadful trip there when it first opened and that was years ago. The Curious Cat´s last blog post ..Merry Christmas folks! Sounds delish! 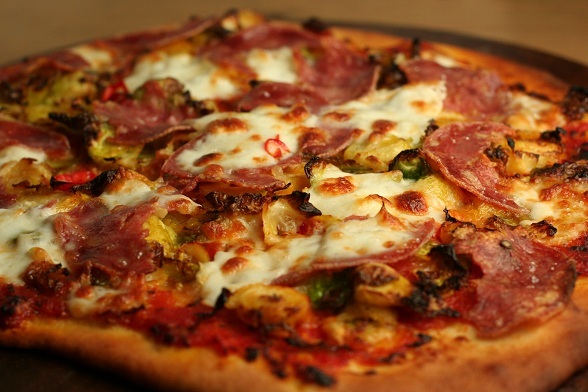 Brussels sprouts sauteed in with pepperoni or salami is terrific, so it’s easy for me to want to gobble this pizza right up! I tried peeling the leaves off Katie but it was taking forever so I gave up.